Two bullets fired on a Sarajevo street on a sunny June morning in 1914 set in motion a series of events that shaped the world we live in today. World War One, World War Two, the Cold War and its conclusion all trace their origins to the gunshots that interrupted that summer day. The victims, Archduke Franz Ferdinand - heir to the throne of the Austro-Hungarian Empire, and his wife Sophie, were in the Bosnian city in conjunction with Austrian troop exercises nearby. The couple was returning from an official visit to City Hall. The assassin, 19-year-old Gavrilo Princip burned with the fire of Slavic nationalism. He envisioned the death of the Archduke as the key that would unlock the shackles binding his people to the Austro-Hungarian Empire. A third party, Serbia, figured prominently in the plot. Independent Serbia provided the guns, ammunition and training that made the assassination possible. The Balkan Region of Europe entered the twentieth century much as she left it: a caldron of seething political intrigue needing only the slightest increase of heat to boil over into open conflict. The shots that day in Sarajevo pushed the caldron to the boiling point and beyond. Seven conspirators joined the crowd lining the Archduke's route to City Hall. Each took a different position, ready to attack the royal car if the opportunity presented itself. The six-car procession approached one conspirator, Gabrinovic (or Cabrinovic), who threw his bomb only to see it bounce off the Archduke's car and explode near the following car. Unhurt, the Archduke and his wife sped to the reception at City Hall. The ceremonies finished, the Royal procession amazingly retraced its steps bringing the Archduke into the range of the leader of the conspiracy, Gavrilo Princip. More amazingly, the royal car stopped right in front of Princip providing him the opportunity to fire two shots. Both bullets hit home. "When Francis Ferdinand and his retinue drove from the station they were allowed to pass the first two conspirators. The motor cars were driving too fast to make an attempt feasible and in the crowd were many Serbians; throwing a grenade would have killed many innocent people. When the car passed Gabrinovic, the compositor, he threw his grenade. It hit the side of the car, but Francis Ferdinand with presence of mind threw himself back and was uninjured. Several officers riding in his attendance were injured. The cars sped to the Town Hall and the rest of the conspirators did not interfere with them. 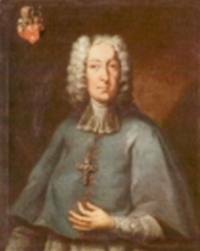 After the reception in the Town Hall General Potiorek, the Austrian Commander, pleaded with Francis Ferdinand to leave the city, as it was seething with rebellion. 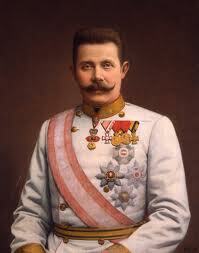 The Archduke was persuaded to drive the shortest way out of the city and to go quickly. Members of the crowd try to attack Princip after his capture The road to the maneuvers was shaped like the letter V, making a sharp turn at the bridge over the River Nilgacka [Miljacka]. Francis Ferdinand's car could go fast enough until it reached this spot but here it was forced to slow down for the turn. Here Princip had taken his stand. As the car came abreast he stepped forward from the curb, drew his automatic pistol from his coat and fired two shots. 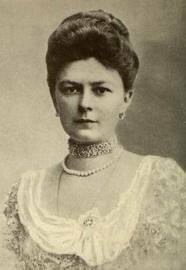 The first struck the wife of the Archduke, the Archduchess Sofia, in the abdomen. She was an expectant mother. She died instantly. The second bullet struck the Archduke close to the heart. He uttered only one word, 'Sofia' -- a call to his stricken wife. Then his head fell back and he collapsed. He died almost instantly. 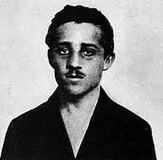 The officers seized Princip. They beat him over the head with the flat of their swords. They knocked him down, they kicked him, scraped the skin from his neck with the edges of their swords, tortured him, all but killed him." At that, I seized the Archduke by the collar of his uniform, to stop his head dropping forward and asked him if he was in great pain. He answered me quite distinctly, 'It's nothing!' His face began to twist somewhat but he went on repeating, six or seven times, ever more faintly as he gradually lost consciousness, 'It's nothing!' Then, after a short pause, there was a violent choking sound caused by the bleeding. It was stopped as we reached the Konak." Brook-Shepard, Gordon, Archduke of Sarajevo (1984); Dedijer, Vladimir, The Road To Sarajevo (1966); Morton, Frederick, Thunder At Twilight (1989). 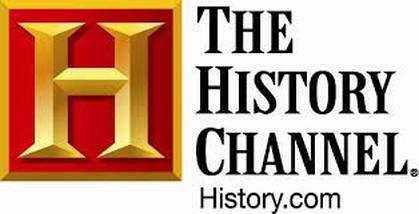 Click on picture to go to history.com. Articles, pictures, inter-actives, and videos. 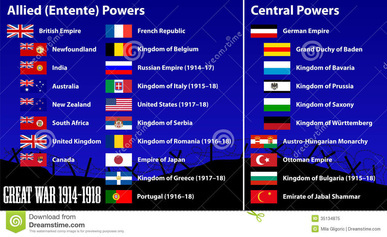 Click on picture for history of World War I.